Washington state is finishing work on its largest wildlife bridge. 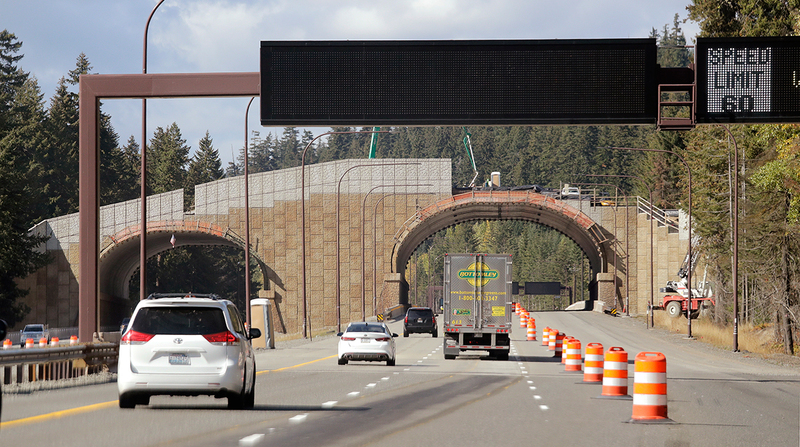 The 35-foot-tall, 66-foot-wide structure, which carries a $6 million pricetag, emerges from the forest and forms two arches above the highway, one for each direction of traffic. Fencing and landscaping will be installed to guide animals across the bridge, and 8-foot walls will block car noise. At least one animal already has used it. Washington’s Transportation Department tweeted last week that a wildlife camera captured video of a coyote scampering over I-90 on the new structure. “Excited to see what other species cross!” the agency wrote. Scientists pinpointed the area as part of a natural migration route from the Cascades to Keechelus Lake, about 60 miles east of Seattle, project spokeswoman Meagan Lott said. Animals, especially elk, move to the lower lands as the seasons change and the mountains get colder and snowier. A 2008 U.S. Transportation Department study found collisions between animals and humans have steadily increased, totaling 5% of all crashes nationwide and, at the time, costing about $8 billion to the economy, including everything from car repairs to emergency room visits and carcass disposal. But Renee Callahan of the Montana-based Center for Large Landscapes Conservation says driver-animal collisions remain vastly underreported. She points to a 2017 study by Virginia’s transportation agency that showed law enforcement tallies of deer-driver collisions were 8.5 times lower than the number of carcass removals. An adjusted tally showed deer collisions ranked fourth among the 14 types of costliest collisions in Virginia, adding up to more than $500 million per year. Collisions between animals and drivers are rarely fatal to people but often deadly to wildlife. The 2008 federal study also found 21 endangered or threatened species in the United States are affected by vehicle hits. In Canada’s Banff National Park, research has found bridges, underpasses and fencing cut the area’s animal-driver collisions by 80%. Another set of crossings and fencing in Wyoming built for a pronghorn migration has seen drops beyond 85%. Biologist Patty Garvey-Darda of the U.S. Forest Service has worked on the I-90 crossing from the beginning. She says the bridge will pay for itself when the highway is not fully or partially closed by animal hits.